Xeroid, the latest game from AMCOG Games, has been given a new lick of paint, with a new version released featuring more levels, more music, and, well… more! The third RISC OS game brought out by AMCOG, Xeroid was released at this year’s Wakefield Show, and sees the player piloting a ship along a space highway, trying to reach the end before the time runs out. 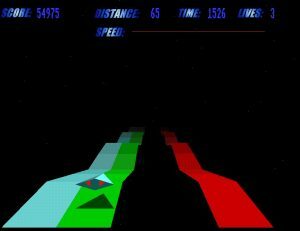 The highway features different coloured surfaces, each of which has a different effect on the ship, and the highway acts as a gravity shield, preventing anything above it being sucked into the black hole below – so leaving the highway isn’t the best plan. Seven new levels, the first of which doesn’t require a pass-code to play (with the pass-codes for the remaining six levels revealed as you reach them). Improved MP3 playback performance – courtesy of AMPlayer 1.40 (which can be installed from the audio modules in the game if necessary). The game now supports VirtualRiscPC running RISC OS 4. The game costs £9.99 and is available from !Store, and the full source code is included. For those who have already purchased the game, the update is free. If you purchased it via !Store, you can simply download the latest version, and if you purchased it directly from AMCOG’s Tony Bartram at a show, you should find a code in the packaging that will enable you to download new versions from !Store.